1817-1901. Born in Knox County, Ohio. At beginning of the Civil War, she lived in Galesburg, Illinois. She moved to Cairo, Illinois to treat wounded soldiers. After the war, she was instrumental in obtaining pensions for veterans and for other Civil War nurses. 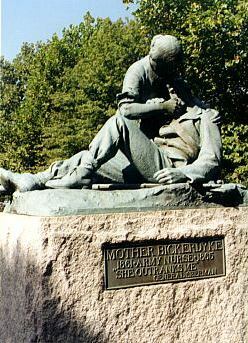 A monument in her honor stands at her burial site in Galesburg, Knox County, Illinois. Father of Modern Dentistry. Served in Company D of the 129th Illinois Infantry. More Details. Mexican and Civil War soldier - Lawyer - Judge - Legislator. Major General. Mexican and Civil War soldier. Brigadier General from southern Illinois. After all my car license plate says Illinois is the "Land of Lincoln" He was born in Kentucky, but became an adult in Illinois. He was the 16th President of the United States during the Civil War. Some Lincoln Web Sites: Abraham Lincoln Online, The Official State of Illinois WWW Site's Links to Lincoln and US Presidents. Brigadier General promoted to Major General. He resigned in November 1864. Photo of John A. McClernand from Augustana College. Lawyer and statesman in Illinois. A member of the "Long Nine". One of Cassius Clay's "Clay Guards" who protected Washington, D.C. immediately after the incident at Fort Sumter. Paymaster for the US Army.